East London may be a hipster’s playground, but parts of it are still very much the preserve of pinstripes and long lunches. The City of London is the heart of one of the world’s financial districts. It lies only a few minutes walk away from the fried chicken pop-ups and markets of Shoreditch and Brick Lane, but it might as well be a world away. London’s trends seem to change with dizzying speed, but the pubs of the City –always a capital C, this is money we’re talking about – don’t need to chase the tourists or the Instagram crowd. They cater for the local legal and financial workers, those dipping in for a pint or a glass of wine before a train ride to the leaguer suburbs. Some of these pubs – dark wood, gloomy interiors, overwhelmingly male clientele – seem to be little changed from the London of a century ago. Many of them are tucked away in side passages and alleyways that, before the age of Google Maps, meant they were hard to find. I found this pub on a warm springs day back in 2014, when my mum was visiting from New Zealand. There was barely a cloud in the sky and the heat poured off the concrete; we dived into a fantastic, wood-panelled pub tucked into an alleyway. Outside were a few hardy lunchtime drinkers soaking up the Sun. The windows were arranged so half were normal and half obscured, throwing the figure on the left here into a strange, surreal shape. I’d taken along my Lomo LC-Wide, loaded with original Agfa CT100 Precisa, one of the best slide films to cross-process. 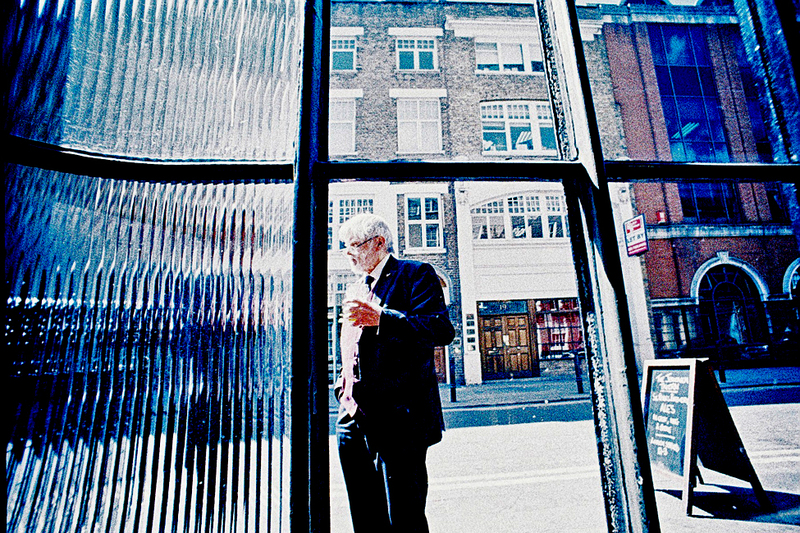 The LC-Wide’s not just for wide-open vistas and streets; here, I managed to squeeze in as much of the window as possible, with the man on the right fitting inside the clear window. We need him to be crisp and clear to throw his mystery drinking mate into sharp relief. It wouldn’t be the same pic without him. I love stopping by a pub in the middle of a hot day anyway – but armed with a camera and a view out the window, those visits can take on an extra dimension.